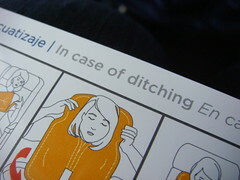 I was on monarch flight Alicante to Manchester Aisle seat not on exit row. Stewardess asked me would i help cabin crew in an emergency…Never had Before? THANK YOU!THIS REALLY HELPED ME IN MY FA COURSE! Awesome! Did the video help on the FA course or the verbal script? For which airline? Republic Airline, perhaps. I’m happy now i can use it as my English airline! Thank you a lot..I really liked the way these announcements are given. This article was very helpful. Thank you.